Looking for something special for your upcoming wedding? 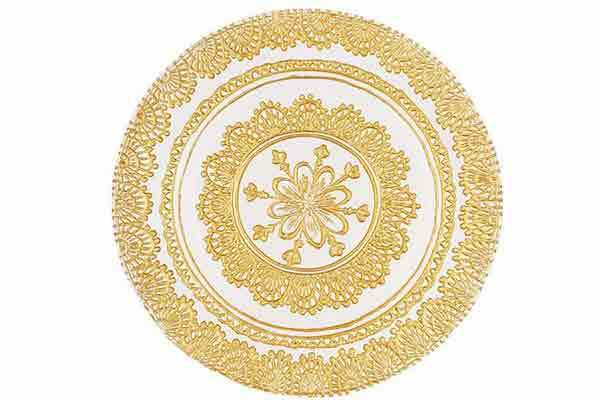 Then look no further than our new gold patterned glass charger plates which are available from Event Hire UK. High quality glass charger plates make for fabulous wedding table settings, helping to create a stunning visual impression to WOW your wedding guests. These gold charger plates are perfect for Asian weddings as well as traditional English weddings as the ornate design will complement almost any existing event decor and styling. You can hire glass plates from Event Hire UK as part of our glassware hire range here online at Event Hire UK. Glassware is just one of the main offerings of Event Hire in the UK which also includes furniture hire, catering equipment hire, cutlery hire and event crockery, providing you with a one stop shop for all your event hire requirements. Working with marquee companies, corporate hospitality event organisers, professional caterers and members of the public, you will be able to source almost everything you need from the same location. And, with hubs nationwide in London, Walsall, Manchester and Bradford, we are perfectly positioned to help you today.